Castle Crag is one of the most attractive of smaller fells, and sits in a splendid location at the Jaws of Borrowdale, where the valley closes down to a narrow gap between Castle Crag in the west and King's How in the east. Castle Crag sits at the foot of the high western wall of Borrowdale, below High Spy and Low Scawdel. 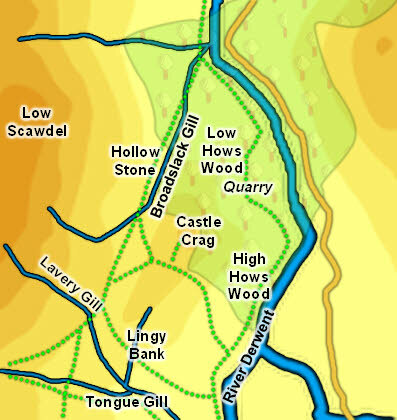 The valley of Broadslack Gill runs between the higher ground to the west and Castle Crag in the east, and helps isolate the northern, higher, end of the fell from other high ground. The highest part of the fell is in the form of a high mound that sits at the northern end of a slightly longer ridge that connects with the rest of the high ground a little way to the south. The northern and eastern flanks of the fell are heavily wooded, with the odd crag popping up out of the trees. Castle Crag's location means that the views are largely limited to Borrowdale, Derwent Water and Keswick, but in those directions the views are superb. The view up Derwent Water towards Skiddaw is the more dramatic of the two, and the least obstructed because of the steep drop off the northern edge of the summit. The top of the fell was probably the site of a hill fort, but the quarry has destroyed most evidence on the one slope that would have needed significant defences, so it is very hard to trace on the ground. There is only one way to the summit of Castle Crag. On the southern side of the summit mount a footpath zigzags up the spoil heap from a quarry that was close to the summit. This path brings us to the quarry, where it splits. To reach the summit look for a path that climbs around the right-hand side of the quarry, then runs along the top of the quarry to reach the summit area. The base of this final climb can be reached up a steep path from the Borrowdale side, or along the Allerdale Ramble. We have two walks that visit Castle Crag. The first is a simple ascent from Rosthwaite. The second visits Castle Crag after walking all around its base, following the riverside path and then heading south up Broadslack Gill to approach the summit climb from the west. The summit sits between the quarry to the south and crags to the north, with trees jutting up from the western and eastern slopes. The main summit area is grassy, but there is a rocky outcropping at the very top, and on top of these rocks is the Borrowdale War Memorial. Broadslack Gill forms the western boundary of Castle Crag, flowing into the Derwent to the north of the fell. Tongue Gill marks the southern end of the longer ridge that has Castle Crag as its highest point. The River Derwent forms the eastern and northern boundaries of the fell. Castle Crag has no tarns. The Borrowdale War Memorial for the dead of the First World War is to be found on top of Castle Crag, in the form of a plaque attached to the side of the rocky outcropping at the very top of the fell. Castle Crag was once the site of a significant amount of industry. Everyone who climbs the fell passes the quarry near the summit, but there are far larger workings on the northern slopes. These are largely hidden in the trees, so most of them are missed by walkers passing by on the riverside path, although it does visit some of the lower workings. This was the summer home of Millican Dalton, a famous Lake District character who lived in caves in the quarry during the summer, until his death at the age of 79 in 1947. Castle Crag is passed by two long distance footpaths - the Allerdale Ramble, which runs along its western flank and the Cumbria Way, which runs along the river to the east.